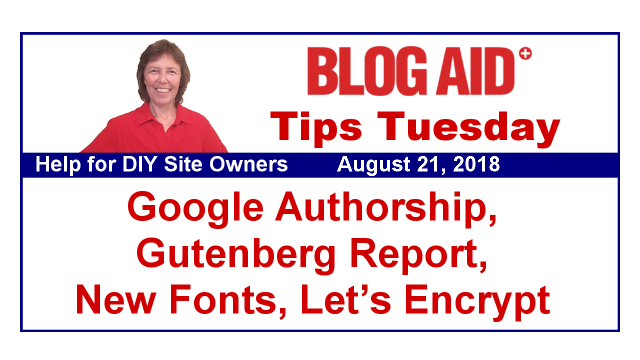 Today’s Tips Tuesday is a wee bit on the techie side, but there was a lot of news for my webmasters, who are mainly designers and site maintenance folks. As a site owner, you need to have at least a passing knowledge of this stuff so that you can better vet anyone who works on your site, designers included. I’ve seen my site audit clients hire designers that wiped out all of the speed and security they just paid me to put on their site. It is radically expensive to hire folks who don’t know the tech of websites and just make things pretty. So, this info is for you too!!! This past week I’ve been a little loaded with site audit clients, including loyalty audits for repeat clients. Those go very fast, as those folks got a great site education and clean up and they know how to keep it that way. For the most part, I could just do updates to the security and such as I went through the audit, and clean out orphaned files and database tables from plugins they tried and deleted, or replaced with better. I also did an audit for a client who was previously at Bluehost and had them do her HTTPS conversion. And they missed some things. So, I got that all straightened out for her and now there are no cracks in the process for hackers to break through, or mixed http and https links in the database. Plus, she now has the proper forced redirect so that humans and bots can’t enter through the unsecured HTTP port. The way it was set up, those were getting redirected to the secured HTTPS port eventually, but not before allowing access to the non-secured port and chewing up hosting resources. That being set up wrong was pretty easy to see in AWStats, and accounted for 6GB of needless bandwidth use. Now we’re saving all of that for humans, and she won’t have to buy a bigger hosting package due to resource overages. And, the redirect time is much faster too, so visitors don’t have to wait to see what they came for. This is just one example of how an audit, and a proper HTTPS conversion, saves and makes you money and keeps your site more secure. In a previous Tips Tuesday I told y’all that I’m dedicated to publishing more how-to tutorials. This one was requested by my site audit clients, so you can thank them for it. If you use videos on your site, you’ll definitely want to check out my new tutorial for how to embed them with an iFrame, instead of the oEmbed code. A lazy load feature can work on iFrames for video the same way it does for images. I did update the post the next day with a note saying that if you use an ad agency, you’ll need to check with them to see if you can use lazy load. Many won’t let you because they already use that for their stuff, and there would be a conflict. That’s really a shame, as those are the sites that are usually overloaded with images too, and they would benefit from lazy load the most. For those of you following along with the house saga, I met with contractors and a string of vendors yesterday to get quotes for a little work I want to have done before I move in. We close on Friday. It will likely be about a month before I move, and as most of you know, I’ve been 95% packed since last month, when the first house deal fell through. So, I’ll be at my desk working through September, with minor disruptions to let vendors into the new place. I can hardly wait to get moved and come out of these boxes!!! As y’all know, I recently took a mini vacation that did me a lot of good, and I’ve been clocking out at reasonable hours since. But, I get a bit board with that now and then, as most of my hobbies are packed up. Plus, having a new place to decorate, and awesome new woodworking areas has my creative juices flowing. I figure it will be another month before I get everything unpacked and my hobby rooms set back up again. But I’ll definitely be making a priority out of my woodworking areas so that I can take advantage of the nice fall weather that is coming. For now, I’m burning up Pinterest, including accounts of some of my clients, and making drawings of things I’d like to create. As you may also recall, a couple of weeks ago we started Flash Challenges for my site audit clients who have elected to join our private Facebook group and that email list. Well, I decided to hold up on the challenge last week so I could create a new member level on the BlogAid Learning Center. That’s the same member site where the DIY SEO course is. And, it’s where the new Gutenberg course will be too. We need a repository of all the Challenge info, as well as tutorials I make for updates that my site audit clients can do themselves. This way, folks can refer back to those tutorials, and new site audit clients can have easier access to them as well. I’ll be completing that setup this week and sending out the invitation to join soon, and then we’ll start our next Flash Challenge on backups. A few years ago, Google ran an experiment with a thing called Authorship. It was their way of trying to connect content creators to a digitally verified identity, namely a profile on Google+. And they gave nice perks for it, like showing your G+ profile image next to your posts in SERPs. I even had a course on it. Well, then they made it so hard to hook up that folks could no longer figure it out, unless they took a course like mine, and usage of it, and G+ declined, so they killed it. I finally got rid of that course, since so many folks thought I was not keeping up with the times for having it. But I may be bringing it back. I met Mark Traphagen back when he became one of the leading authorities on Authorship. And I was delighted to see his recent article on Search Engine Journal on Why Author Reputation Matters More Than Ever for Search. I’ve always maintained that helping Google figure out who writes content for which publisher is a good idea. It’s how you build authority, which is a big part of your EAT score. (EAT stands for Engaging – Authoritative – Trustworthiness). And all of this ties into the huge Google Algorithm update that I reported in last week’s Tips Tuesday, and how it radically impacted YMYL (Your Money, Your Life) sites. I strongly encourage you to go read this article, and pay close attention to the Takeaways for Authors and Publishers section too. And I’ve got it on my to do list to review my tutorials on authorship and bring them up to speed for you too, so you can be sure to make the connections on your site that Google is looking for to determine that you are the author. This will also probably end up being another Flash Challenge for my site audit clients too, so we can go deeper into it for their sites. Woohoo! There’s even more great news for foodie bloggers from Google. You may recall in previous Tips Tuesdays me talking about Google’s call for recipe posts to be marked up with special schema tags so it could be featured in Voice Search. Besides having a Voice Search speaker in your kitchen, there are other devices that combine it with a screen. However, most of them fall super short of being a good tool. Google is about to change that with their new Smart Display that is more like a super voice search speaker and interactive display. And now we know why they are pushing so hard to get more recipes and news stories into Voice Search. I think this thing is custom made to be placed in the kitchen. And I think this will smooth the way for such devices to become the central hub of running a smart home, which is the direction we’re quickly moving. Marilyn and I are on the last stages of our recipe plugin tests, finally!!! We got delayed having to retest one of them while working with support to clarify our findings and ensure they were not a bug on one of the plugins. I believe we have a clear winner too. We will have our posts out to you as soon as we finish comparing notes on the different things each of us tested. And we plan to release them on the same day and cross link to one another. Webmasters and Cloudflare users, you’ll want to at least read the first part of this article on TLS 1.3. TLS stands for Transport Layer Security. It’s basically the highway that the internet runs on. I’ve been setting my clients up with a minimum version of TLS 1.2 on Cloudflare. Even though TLS 1.3 has been recently released, it is not supported by all browsers and I’ve heard of folks having issues with it on WP sites. The TLS 1.3 upgrade is a significant boost to security, and we all want to make use of it any time we can. Settings in Cloudflare make that possible. It will deliver over TLS 1.3 wherever it is available and supported. You get a lot of security perks like this with Cloudflare, and they are always keeping up with the bleeding edge of standards and making them available. That’s true for speed too, like the new Brotli compression that will eventually replace Gzip that most of our hosts are supporting now. On average, I update 12 Cloudflare settings during loyalty audits from my site audit clients. So, if you haven’t had a checkup in the last 18 months, get one scheduled so you can get all of your settings up on the latest security and speed too. This includes everyone on the free Cloudflare plan too. The end of July marked a milestone for the free SSL certificate most of us use. It’s issued by Let’s Encrypt. An SSL certificate has to be trusted by your site visitor’s browser in order for it to display the Secure green padlock or words for HTTPS. Microsoft’s Internet Explorer, which is one of the most backward, late to the party browsers on the planet, has always distrusted Let’s Encrypt until now. That was a huge issue for some websites, whose visitors were mainly government agencies and large corporations, as they still use older versions of IE. The problem was related to SNI, which I don’t want to go into here, as I don’t know for sure whether this new accreditation fixes that or not. I’m just saying for the handful of clients that I have who had to purchase an SSL certificate that was trusted by MS, you may want to check more deeply into this, as it could save you some money if you could drop down to the free SSL certificate. Designers, this is something you might want to pay attention to, as I believe it affects speed. The most recent release of Gutenberg plugin has switched to Material Icons instead of Dashicons for the image used on Core Blocks. One of the things we looked hard at in the revamp of the BlogAid theme were the icons. FontAwesome was heavily used on the base theme. But, a call to that 3rd party library was a real drag on speed, as it brings in a super heavy set, meaning tons of stuff we weren’t using, but had to wait to load. We replaced those with Dashicons wherever we could. And we are still investigating the best way to display social follow and share icons, because the way I had Scriptless Social Sharing set up doesn’t work well on mobile. I’ve been in touch with that plugin developer and she has fixes for it that I’m testing with the help of my designer. It required adding some customizing for the plugub to my new theme’s CSS file, and it looks good to me. I think it’s worth all designers checking into what WordPress will likely natively support in the near future and see about using those wherever you can instead of FontAwesome or even Dashicons. Material Icons uses SVG images, which is also the way everything is eventually going, and something that has Google’s stamp of approval on already. This change of icon sets will also impact everyone who makes a custom block for Gutenberg, like those for special plugins. Things like this icon change would radically impact any tutorials I would make on Gutenberg, which is a huge reason why I have not started on them. I’m still poking around and making notes, though, so I can get up to speed with where Gute is now, and keep on top of the changes. As I mentioned last week, my first priority with tutorials is to throw everything I can at Gute to see what it can’t do yet. They will be common things I do on my own site. This will help folks determine if they want to use Gute now, or give it time to mature. The latter is my choice for my own sites, and what I’m advising most of my clients to do as well. But, I do have to cover what’s going on with Gutenberg for all the folks who are ready to jump on board with it. And if you’re curious what trying to create a post in Gute is like, check out this article on WPTavern from Jeff Chandler, who has been chronicling his journey with it. This may convince you why I suggest waiting until Gute matures more before making the switch. Just creating a post is radically different from what you’re used to, and they haven’t made the writing process flow as easily as it should. For those of us in the habit of creating our content elsewhere, like Google Docs, I can’t even imagine how jerky it will be to jump back and forth with having to bust up everything into unique paragraph blocks. And, you better believe I’ll be checking into the extreme uptick in host resources used for it taking longer to format a post too. I see this all the time in site audits, where clients are the biggest user of their own resources by staying logged in with a text editor window open. The auto save clock is constantly ticking. Yes, Gutenberg is not friendly for those that write posts outside of WordPress! So hard to switch it in. But, it’s also not easy for those that draft inside WordPress. Who knows exactly what their paragraphs are going to be during drafting?! Yeah, Gutenberg is definitely going to throw a monkey wrench into our creative flow. But, I’m positive 3rd party devs are already working on ways to help with that. It’s just one more reason I’m advising folks to hold off on the switch until Gute matures more.